Samsung's range of low-cost laptops is anything if not predictable. The N120 clings on to most of the same features as the N10 and the N110 before it. 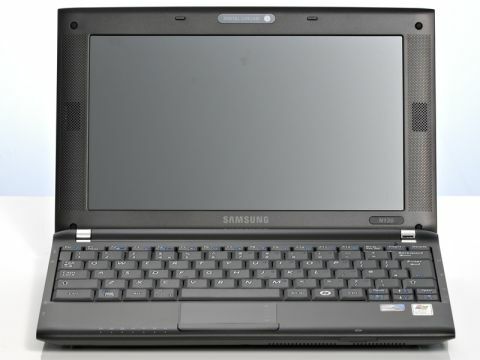 The Samsung N120 has the Atom N270 processor, the same chip that's at the heart of most of the world's netbooks. It has 1GB RAM, and with that magic number comes permission to pre-install Windows XP. So far so standard, bar the rather generous 6-cell battery which gives you a realistic five and a half hours of use on a single charge. The graphics processor is a step up from those in the original wave of netbooks, though. Intel's GMA950, the chip inside the N120, has been derided in many circles thanks to a slight lack of support. It's pretty tricky to get it working properly with Vista, for example. But many people seem to miss its key asset -- it makes 720p HD video work. On a netbook of this price that's no mean feat, but we're happy to report that HD Windows Media Video plays back brilliantly, without stuttering or jerking. That's very impressive. But it's not necessarily enough. With this machine hovering at around £100 more expensive than the lower end of the market, it needs a bit more than its video processor to help it get by. Samsung's first trick has been expanding the width of the case by about an inch and a half, allowing for a wider keyboard. It certainly feels less cramped than narrower machiens of the same caliber, although we had a few issues with the layout. Notably, the right shift key is narrower than usual; if you're used to hitting shift with your right pinky, be prepared to accidentally insert a lot of slashes rather than capitalising. That extra width means more than just a wider keyboard. It has enabled Samsung to move the speakers from the base of the unit to the sides of the screen, and include a subwoofer for a bit of extra oomph. The change is excellent; where most netbooks are tinny and rather flat sounding, the N120 is punchy and thick. It's a proper media machine, really. If only the glossy black screen had a wider viewing angle, we wouldn't hesitate to recommend it for watching downloaded movies on the train. As it is, it's pretty tricky to spend any real time watching movies on a screen which changes colour with the slightest move of your head.